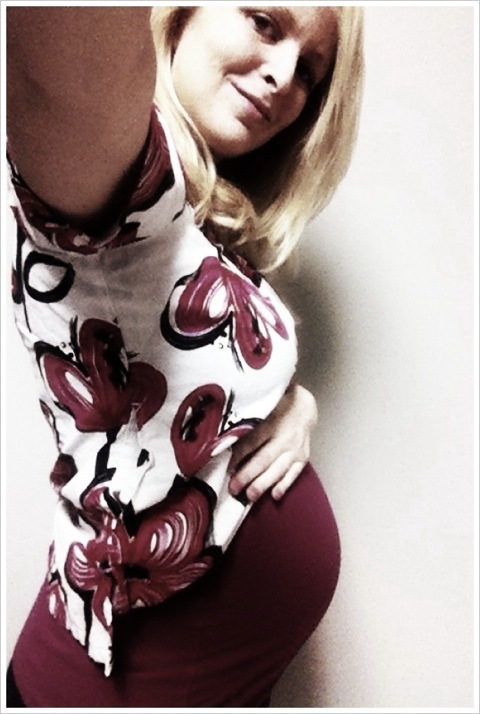 So during my daily work photo shoot I noticed…I DO NOT look 8 months pregnant in this picture! What is up with that!? And BOOM goes the dynamite!! How did this not show up in the first angle? I guess you can’t be looking at me from atop a building and see that I’m pregnant. You must be eye level with the bump. I’m officially 8 Months pregnant! It feels very strange to think that my due date is at 10 months. People really give you the stink eye when you are 8 months pregnant and due 2 MONTHS LATER! I want to give out a little memo about how pregnancy lasts 40-42 weeks instead of just 36 weeks everytime someone inquires about my due date. This brings me to another concern…I think my due date is wrong! By 2 weeks almost! I KNOW when it happened…but I’m not sure what warrents an offical due date change. I really started to think about it last week when I was told I was measuring a little over a week ahead…it all makes sense now! I supposed it’s not the end of the world… so I’ll let it slide! Size of baby: She should weigh around 3.75lbs. And will gain 1/2 a lb a week from now on! … So that’s why I’m so tired! Large jicama (what the heck is that?!) Okay here’s a better reference…she’s the size of the front wheel on the original big wheel! 🙂 I got that from a really cute blog I stumbled upon! (http://www.hisboyscanswim.com/dads-pregnancy-guide) There’s another post on the same blog about pregnancy gas that is HILARIOUS!! Cravings: Ice cream for sure. I eat that about every other night! WATER please!! I can’t get enough of it. I think that means that baby’s fluid is restoring more often than in the past…because I will drink a couple GALLONS a day…and I can assure you that only 1/8 of that comes back out! Information overload on that one! I find myself exhausted some days…and they’re usually the days where I’ve done NOTHING! I can only describe it as the first day of the flu. Ya know…that day where you’re not sure that you’re actually sick or just have a little allergy problem but you’re SUPER tired! And you’re in denial that your really sick. That’s it. That’s the feeling I get. Shortness of breath…stairs really get the best of me. Or if I turn to quickly to one side in the bed I will start coughing because I feel like my lungs can’t fill with air. Poor self-esteem. Ya’ll I’ve never weighed this much in my life and it’s hard. We don’t have a mirror in our bathroom, and normally that would be a big problem – not right now. I don’t want to look at myself! I’m pale…I’m an extra 20 (?) lbs…I walk funny…the list goes on! I can’t even fit into all of my favorite PJ’s…and I thought those were forgiving! I’ve been trying to do things for myself lately like get a pedicure, paint my nails, apply self tanner every day (HELL-O Snookie! ), and fluff my hair up a little…but it’s still hard to bump the negative thoughts out of my head! Sleep: HAHAHAHAHAHA!!! I wish I could just sleep for a solid 8 hours. I get 5 hours max. And they’re just not sound…I almost always wake up at random times and then hear things that grab my attention and make it hard to go back to sleep. If I’m working the next day I will almost surely wake up 45 minutes before my alarm goes off…just to RUIN those last few minutes of sleep I could’ve had. So irritating! My showers! I’m so excited for them both! I will make a post with the invitations on them once I edit out the addresses! I guess I need to post on “The Great Belly Button Watch” because something big is going on there also!! 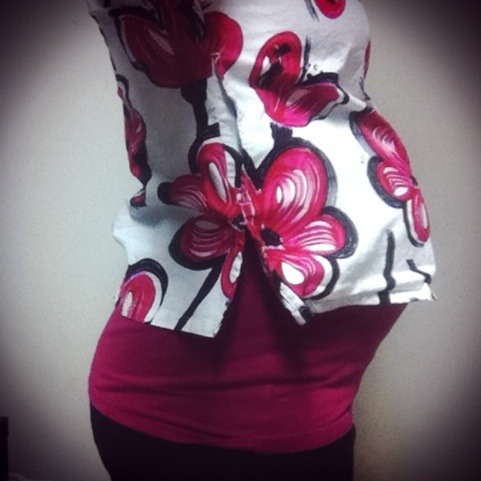 We tour the maternity floor at my work next Monday… THAT BEING SAID… I want to tour the NEW BROOKWOOD WOMEN’S CENTER! But the sad news is that it doesn’t open until my official due date of December 3rd! What luck! They won’t do tours until that date either! Since I work here and I’m sneaky…I investigated just waddling myself down there and taking a peek without any specific guidance… big negative. Not happening. I asked an inside source about what sort of steps I would need to take to just peer into the new womens center and I was told to stay away! Apparently last week a construction worker bit the dust in the new center. For real. If that’s not bad ju ju…I don’t know what is! I don’t want to be smooshed! I will wait. But regardless, what a bummer. Time for Spaghetti O’s! Peace. you do not look bad for 8 months pregnant! How do you do it? I look like a short fat ompahloompah! Tell me about it though… I have trouble dealing with how much I’ve gained, I have never weighted this much in my entire life or ever thought I would reach this weight. It is depressing sometimes that I refuse to go out because people really do stare at you like you’re a circus freak at times. So I feel you! Your post is so cute BTW, I really need to make my posts more interesting and fun like yours! Thank you for your comment! I was so excited when I saw because you’re my first! Hooray!!!! 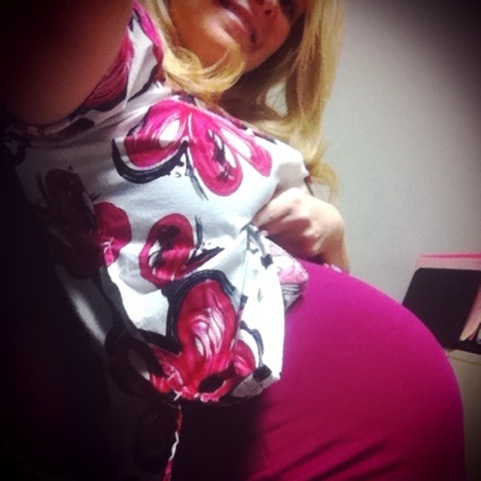 To answer your what have I done to keep myself up to par while preggo…don’t get mad…not a dang thing!!! The thing that saved me was I threw up daily for the first 4-5 months so I didn’t gain anything til after…if I’d not been sick, I wouldve eaten everything and my boyfriend would have to get a lift to transport me places! My daddy gave me these awesome genes of being slender…thanks dad. I dont run unless a devilish beast is chasing me-in which case if u see, please call 911 and run yourself. But yea even after only 20lbs . I feel like people stare and think oh look at that trashy pregnant girl livin off our govt money( I’ve found myself goin out in public no make up, pjs on, and hair a mess)!! One thing that gets me out of my funk is to fix my hair and makeup and find a favorite top to wear. Shave my legs (if I can reach them past my butterball)…and try to just go out once a week w my honey. Then he’ll feed me like I’m a starving cow-but I look fabulous shoving that food in my face! 🙂 I’m excited to read up on ur blog now!